I toggle between loving and hating this season of settling into our home. I love having a fresh, clean palette to work with. I hate the budget component. I love nailing into the walls with gusto because I know we won’t have to patch them like we did in our past rentals. I hate how long it takes complete projects amidst everything else in life. 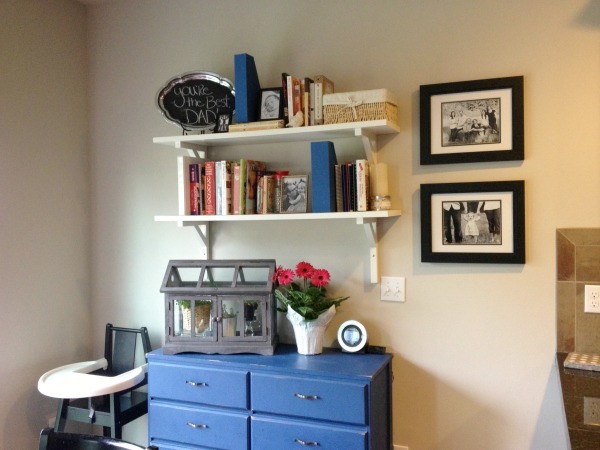 I love treasure hunting for bits and pieces to add character to our home. I’ll end with love, because most of all, I am loving this process of layering elements of our home to express who we are and things we love. Here’s the entry … one of my sweet sponsors, vol 25, (who is also from the Northwest!) 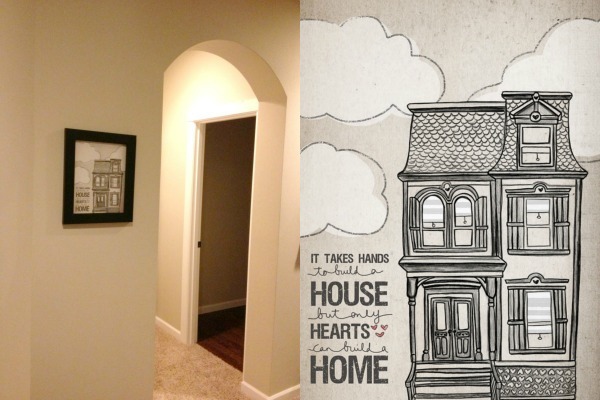 sent this darling print to me and it fits so perfectly as a “welcome” when friends grace our home. Jessica, the brilliant artist behind this print, blogs here, she is def worth a read. I loved her succulent post and her two girls are the cutest! This was my Great Grandma Gertrude’s sewing machine. I was so happy to have a place for it in the corner of our dining room. Inspired by this pin, we created a photo collage wall in the downstairs hall. 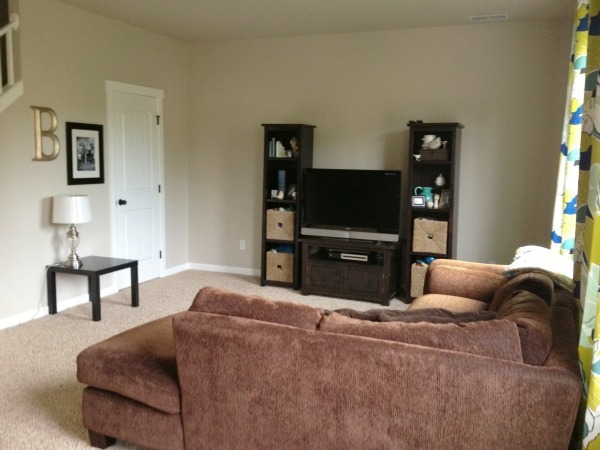 We have grand plans for this space – a large wall entertainment center and a new, two piece couch set. When that happens, this arrangement will move into Dominic’s man cave. But, for now, this is the living room. Since taking this photo I’ve switched out the curtains … these felt to modern and I’m going for more of a vintage anthro farm feel. I replaced them with these from IKEA, but Dominic doesn’t like them so we’re still curtain hunting. The hard part is, I need 98″ ones and those are hard to come by without breaking the bank. 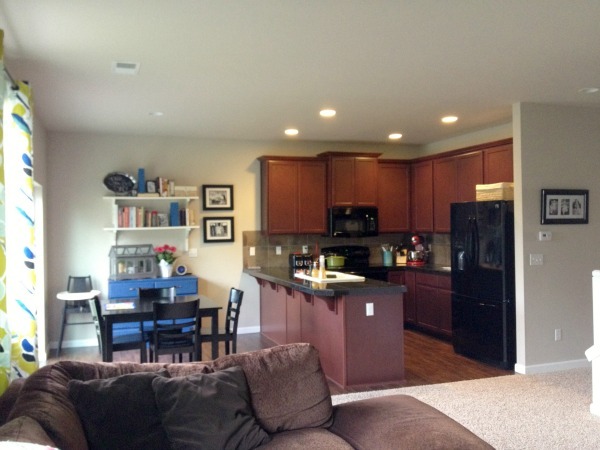 This is where we live – between the kitchen, nook and living room. 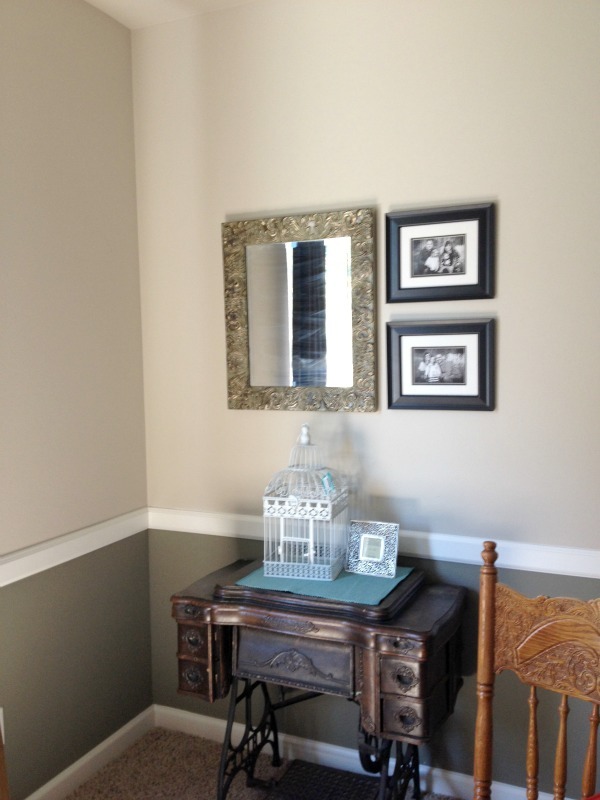 We are considering painting the cabinets white to brighten the space – but that’s a project for another day. This is my favorite corner of downstairs. I love that Dominic painted the storage dresser and having my cookbooks out and about encourages me to reach for them more often than not. 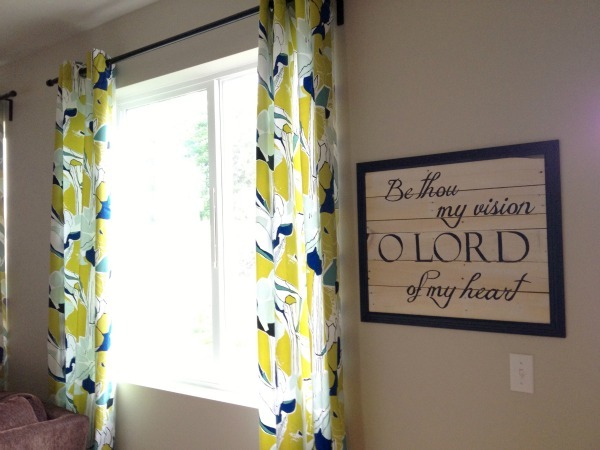 The curtains that are no more, but the point of this photo is my awesome Mother’s Day gift – a phrase from my favorite hymn. A custom from Touch of Color. The chair I often blog from. 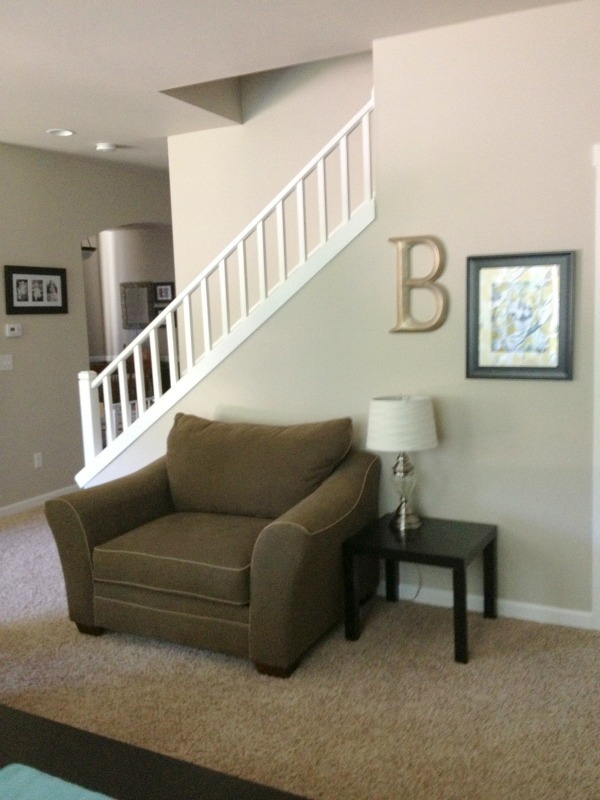 And a question, the stair wall … do I put something there? Leave it blank? What is on your stairs? 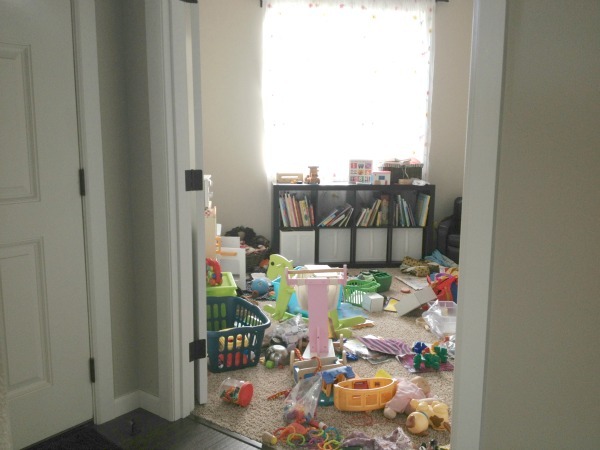 And … just so you don’t think my house is always picked up … because it rarely never is – here’s the play room. Yay – we’re working on the whole “it’s time to pick up” thing. It seems that I missed a photo of the timing room, but it’s nothing special. Just a table cloth covered 1980s oak hand me down from my parents :) The plan is that Dominic will build us a large farm table someday. 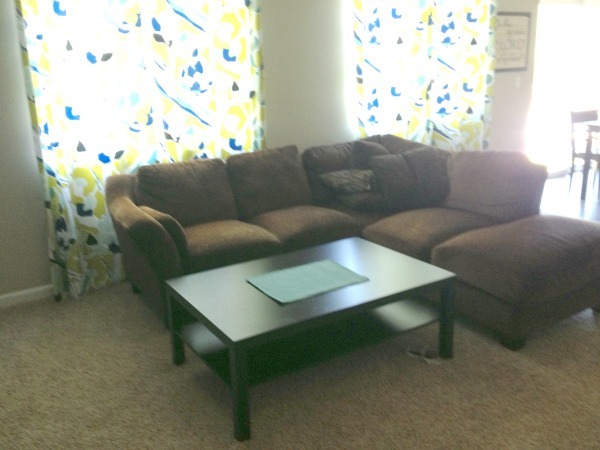 Or, if this table goes on super sale, we might snag it instead. Ok, now a little feedback … paint! Everything is a soft tan which is a decent neutral, but I feel like the downstairs needs a little pop. An accent wall in the living room maybe? I’m planning to paint the play room a subdued yellow and move forward with a You Are My Sunshine theme in there. 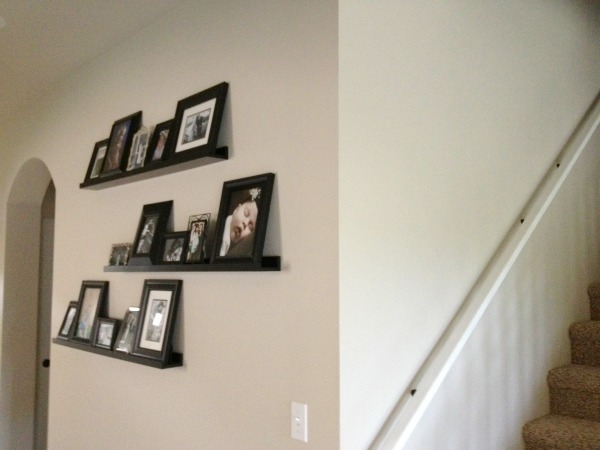 But I’m hesitant with paint everywhere else because there aren’t defined walls – how does that work? I couldn't agree more…budget and time frames make getting stuff on the house done such a pain. Our bedroom and bathroom is a constant mess bc we can't afford to buy furniture and remodel it. :/ I really love your corner nook!! Seriously – isn't it the best knowing you aren't moving soon! I love that feeling!! !